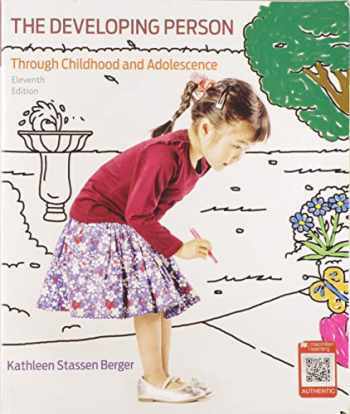 Acknowledged author Kathleen Stassen Berger wrote Developing Person Through Childhood and Adolescence comprising 624 pages back in 2018. Textbook and etextbook are published under ISBN 1319058132 and 9781319058135. Since then Developing Person Through Childhood and Adolescence textbook received total rating of 4.5 stars and was available to sell back to BooksRun online for the top buyback price of $72.30 or rent at the marketplace. Exceptional in its currency, global in its cultural reach, Kathleen Berger’s portrait of the scientific investigation of childhood and adolescent development helps bring an evolving field into the evolving classroom. Guided by Berger’s clear, inviting authorial voice, and page after page of fascinating examples from cultures around the world, students see how classic and current research, and the lives of real people, shape the field’s core theories and concepts.In addition to Kathleen Berger’s exhaustive updating of the research, this edition is notable for its thorough integration of assessment throughout (learning objectives, assessments after each section, expanded end-of-chapter quizzes) all aligned with national standards. The new edition is also more than ever an integrated text/media package, moving students from the printed page to online tools that help them develop observation and critical thinking skills. Those online components are all a part of the book’s dedicated version of LaunchPad, Worth Publishers’ breakthrough online course space in which power and simplicity go hand in hand. New Media OptionAchieve Read & Practice, combining a complete eBook with LearningCurve adaptive quizzing. For more, see New to this Edition.